Badlands backpacks cover everything there is to consider when deciding which hunting backpack to buy. Comfort and toughness, are only two of the reasons we chose these quality packs. Their backpacks are all made of the highest quality materials and are sewn in such a way to maintain integrity even under the most grueling conditions. Having completed research to develop their products, they also thoroughly test them before release to be sure they meet the company standard. I have chosen Badlands backpacks over all the other brands for some very obvious reasons; quality, comfort, warranty and customer service. Badlands scores 10 out of 10 in every one of these areas. Badlands has chosen to follow the high road by using state of the art fabrics and fasteners for their packs. Badlands backpacks are sewn together with boot thread, not just some cheap seamstress thread. As an added feature to all stress points the backpacks are bar tacked using Arimid thread. Arimid thread is super strong (and expensive), capable of lifting 50 kg with a single strand. After extensive research Badlands packs decided on KXO-32 fabric for the manufacture of their packs. Quiet, water resistant and durable this fabric represents cutting edge technology in pack manufacturing. These packs are made to last. Early morning glassing for moose. I am wearing my Superday Pack today. If you are anything like me when you hunt, you put a lot of miles under your boots. 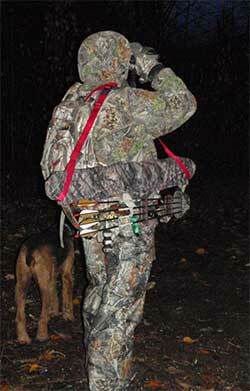 There is nothing worse than wearing an uncomfortable pack while hunting. If weight is not evenly distributed, or cannot be shifted through adjustments you may run into problems. Badlands backpacks have molded hip belts and adjustable top load straps to help you though the day. Sometimes just as small adjustment can make huge differences in comfort. When a pack is loaded you have to be able to walk back to your start point without crippling yourself... get a Badlands pack and you won't look back. Badlands Packs Warranty may be matched, but it is unlikely it will ever be beaten. An unconditional warranty, no strings attached... you own it, they will fix it. It is that simple. Read it for yourself. Answering the phone, returning emails, heck I saw at least one instance Badlands were answering questions on their Facebook Page... on the weekend. I have never seen customer service like that. Period. When you consider Badlands Packs as a whole it is no wonder their product is so popular. Think through the warranty, how could a company make a poor quality pack and offer a warranty such as this? They are obviously standing behind their product. When I am looking for a new pack, I have a checklist that I use to help me determine which pack is most suitable. How much moose hunting gear do I need to carry? How far or how long am I going to have to carry the pack? Am I going to pack out more than I carried in? How much more? Do I need a pack that can carry a handgun, bow or rifle? Am I carrying a number of small items, or just a few large ones. Badlands backpacks are all measured in cubic inches of carrying capacity. When trying to decide on a pack it is advisable to accumulate all your gear into a pile and take some rough measurements. Fold or stack your hunting gear on a table in the most condensed pile you can. Then using a measuring tape, measure your pile and write down the measurements. After gathering all my moose hunting gear that I need for a day trip, I lay it out on a table. I am assuming that the only extra thing I will have to carry out of the bush is a section of moose liver. I allow 240 cubic inches because I do not want the whole thing; we just bring out enough for a few meals. Now, after stacking all my hunting supplies I take my rough measurements. Let's just say that I measure lengthwise 25 inches, width 16 inches and height 12 inches. Now multiply all these numbers together 25 X 16 X 12 = 4800 cubic inches, add in the 240 for the liver and I get 5040 cubic inches. I know that that sounds like a ridiculous amount of moose hunting gear for a day hunt... because it is. This was only an example, remember? Now you know how to evaluate the carrying capacity for your hunting supplies. Seriously though, if after you measure your gear for a day hunt and you come up with a large number like that, you just might want to look at reducing the amount of hunting gear you are planning to carry in your hunting backpack. One important factor to remember when doing these calculations is the compression. One can assume your measured gear will compress about 30 percent which would bring the total to something more in the range of 3500 cubic inches. Getting back to choosing your Badlands backpack. With a total hunting gear amount of 5040 cubic inches it is easy to determine a pack to fit. Obviously a pack with only 2800 cubic inches capacity will not do, unless you plan to tie your extra gear to the outside. Badlands backpack line-up includes a couple of backs that would meet the 3500 cubic inch requirement. The OX has a 4400 cubic inches capacity and the 4500 has 4500 cubic inches capacity. With room to spare if you were to decide to store an extra clothing layer or something else. These are only examples of course, to see the entire Badlands line-up visit their website to determine the most suitable pack for your needs. Find a dealer near you, then get outside and use your new pack. The following video is our look at the Badlands Superday Backpack. Badlands packs are well made and the company stands behind their goods. I recommend these packs for you to use. The Superday or the 4500 packs might not be the exact pack for you, but that's ok. There are many backpacks to choose from... get the right one for you.